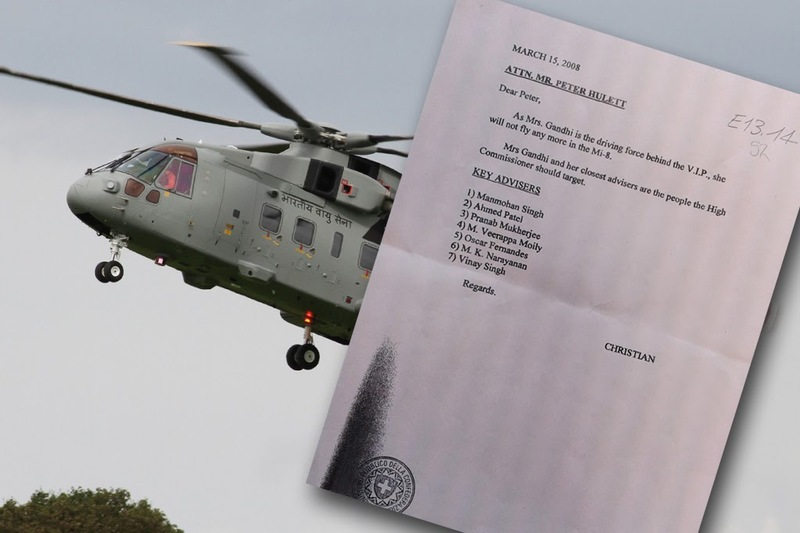 A March 2008 note purportedly written by arms businessman Christian Michel to Peter Hulett (at the time, AgustaWestland's India boss) has exploded in the Indian press after it was put out by an Italian newspaper last week. The note has reportedly been produced in court by Italian prosecutors in their ongoing case against AgustaWestland on charges of corrupt practices to swing international helicopter contracts. Well, it's a no-brainer why the note has smashed into the front pages of nearly every paper in India today. It's an incredibly simple note, almost childlike in its forthrightness. I love, especially, how Mr Michel cuts right to the chase. No 'how are you?' or 'hope this finds you in good health' or any of that other stuff people bung into the top part of their letters and notes to soften the drudgery of business correspondence. Here's the brilliant opening line: "As Mrs Gandhi is the driving force behind the V.I.P, she will not fly any more in the Mi-8". I can almost hear Michel mutter it, a little impatiently. And just in case he isn't clear enough about what he's talking about, Michel hammers it home with the second line of his hilariously elegant note: "Mrs Gandhi and her closest advisers are the people the High Commissioner should target." Oh, alright then. Of course, Michel wouldn't be worth whatever he was being paid if he didn't follow up that genius introductory advice with some actionable targeting solutions. He doesn't disappoint: He lists seven of Sonia's Gandhi's 'key advisers', including India's then (and current) prime minister Manmohan Singh, then foreign minister (now President) Pranab Mukherjee, Sonia Gandhi's political secretary Ahmed Patel, then national security advisor (now state governor) Mayankote Kelath Narayanan, two union ministers known to be close to Sonia Gandhi and a guy called Vinay Singh, who I personally haven't heard of before. 1. It was written in March 2008, a month after field evaluation trials of AgustaWestland's AW101 and Sikorsky's S-92 were carried out in the UK and U.S. respectively from 16 January 2008 to February 2008 (from the MoD's official timeline of the process here). 2. A month after the note was written (and again, this is just to establish time context), the Field Evaluation Trial team submitted its report recommending the AgustaWestland AW101 for induction into IAF service. As the MoD notes, the Special Protection Group (SPG), which provides executive protection to the country's top leaders and the Gandhi family, was also part of the Field Evaluation Trial team. 3. The €556.62 million deal was signed on 8 Feb 2010, less than two years later. A couple of things jumped out at me. First off, any company that pays good money to be told stuff that their embassy knows anyway has to have money to chuck. Second, Christian Michel couldn't possibly have been hired just to provide apparently basic, blindingly obvious advice. In fact, the man's role clearly goes a whole lot deeper than this simplistic little note reveals: a report by TV news station CNN-IBN last week says Michel has a lot of Indian immigration stamps on his passport -- "Michel flew in and out of India six times between January 12 and February 14, 2013. When Michel's name was being discussed in the media in 2012, he had visited India a total of 31 times between 2011 and 2012," says the report by the station's national affairs editor. It's election season. Expect more.